High-resolution P wave tomography shows that the crust-mantle structure beneath eastern Asia is composed by the stagnant subducted Pacific slab in the mantle transition zone (410-660km in depth), continental lithosphere and a wedge upper mantle in between. This crust-mantle structure is so called "big mantle wedge". 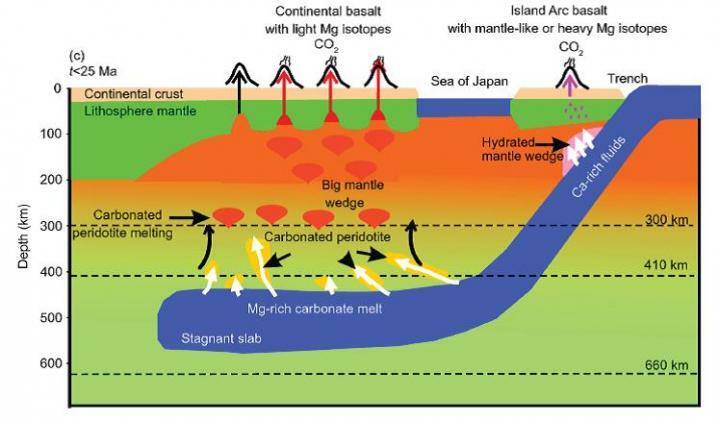 Timing of the big mantle wedge formation beneath eastern Asia is critical to understanding of the interaction between the west Pacific subducting plate and continental margin in eastern Asia. In addition, the continental lithosphere in the North China, which is a part of lithosphere of the big mantle wedge, had been an ancient and thick (~200km) lithosphere that is so called "North China craton". However, the eastern part of the North China craton has been thinned since 130 Ma, with the thinnest portion about 70km in depth. Formation time of the big mantle wedge and mechanism of the lithospheric thinning of the North China craton are two important issues puzzling the world Earth scientists. Previous studies have ignored the influences of recycled carbonates into the big mantle wedge through Pacific plate subduction on lithospheric thinning of the North China craton, which has been investigated by a recent study. Recent systematic studies on the Mg isotope geochemistry of Cretaceous and Cenozoic continental basalts from eastern China and circum-Pacific island arc basalts revealed that the upper mantle beneath eastern China is a vast store of subducted carbon. The subducted oceanic crust carrying sedimentary carbonates was partially melted in the mantle transition zone. Carbonated silicate melts derived from partial melting of stagnant subducted slab in the mantle transition zone rose, penetrated into and reacted with the overlying mantle to form carbonated peridotite (Figure 1). Based on the oldest age of alkaline basalts derived from the carbonated peridotite in the big mantle wedge, this study demonstrates that the big mantle wedge in eastern Asia was formed 125 Ma. The carbonated silicate melts produced by partial melting of the carbonated peridotite in the big mantle wedge migrated upward and interacted with the overlying lithospheric mantle, resulting in carbonated peridotite and partial melting in the bottom of continental lithosphere beneath eastern China, thus its physical characters are similar to the asthenosphere and it could be easily replaced by convective mantle. As a result, the cratonic lithosphere in North China would be thinning and the carbonated silicate melts will be transformed from low-SiO2 strongly alkali melts to high-SiO2 alkali melts. This study opens a new research field concerning geodynamic effects of deep carbon cycles, provides a new constraint on timing of the big mantle wedge beneath eastern Asia, a new mechanism for lithospheric thinning of the North China craton, and a new model for chemical transformation from low-SiO2 nephelinite or basanite to high-SiO2 alkali basalts. This research was funded by the National Natural Science Foundation of China (Grant No. 41730214) and the Strategic Priority Research Program (B) of the Chinese Academy of Sciences (Grant No. XDB18000000). See the article: Li S. G. and Wang Y. 2018. Formation time of the big mantle wedge beneath eastern China and a new lithospheric thinning mechanism of the North China craton–Geodynamic effects of deep recycled carbon. Science China Earth Sciences, 61(7): 853-868, doi.org/10.1007/s11430-017-9217-7.